Since I've gotten into a new routine, I've on a cooking roll! 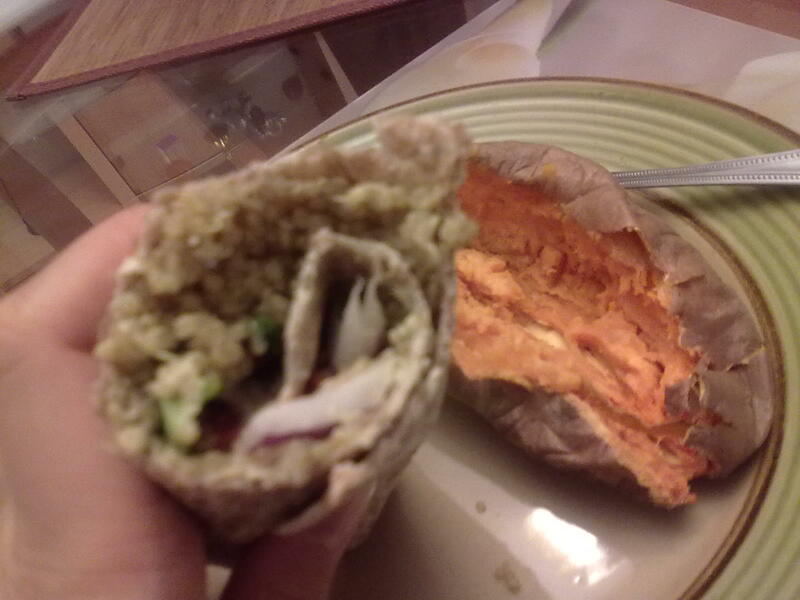 This sure beats the "cereal dinners" or "hummus and pita chip dinners" of yore (not like they won't happen anymore, just more seldomly!)! 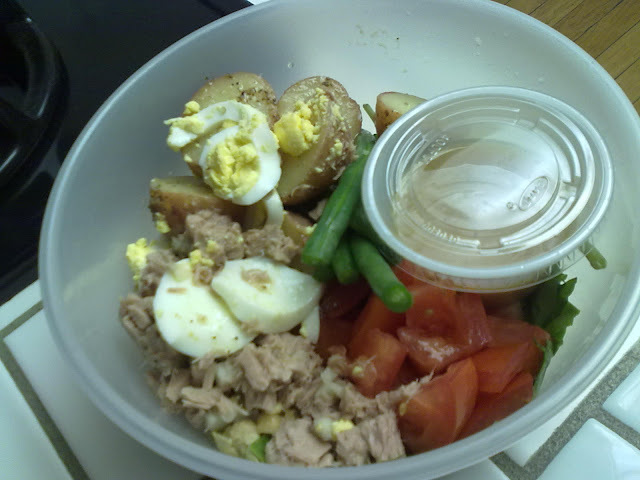 This nicoise (rough pronunciation: knee-shwaa) salad was inspired by one I saw at Fresh & Easy (Neighborhood Market). I think these salads are common in France, although I'm untraveled, so I wouldn't know. 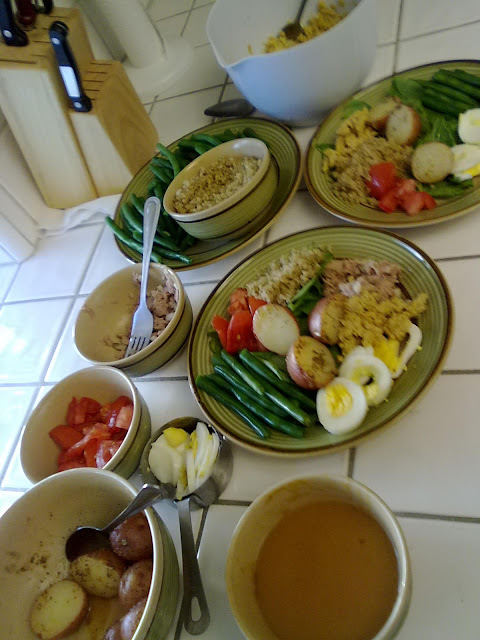 The actual cooking involved included boiling eggs and potatoes, cooking quinoa, and blanching green beans. Here's the intermediate/end stage of the salad assembly. These plates were enjoyed with little nibbles of cheese and wine from "The Ukrainian." Followed by some watermelon and a couple of mini rice-cakes. Schm-ancy? Yes. Eggs: One cracked as I placed it in the pot to boil. Leave it to me, huh? But nothing came out of it, and it actually made it easy to open! 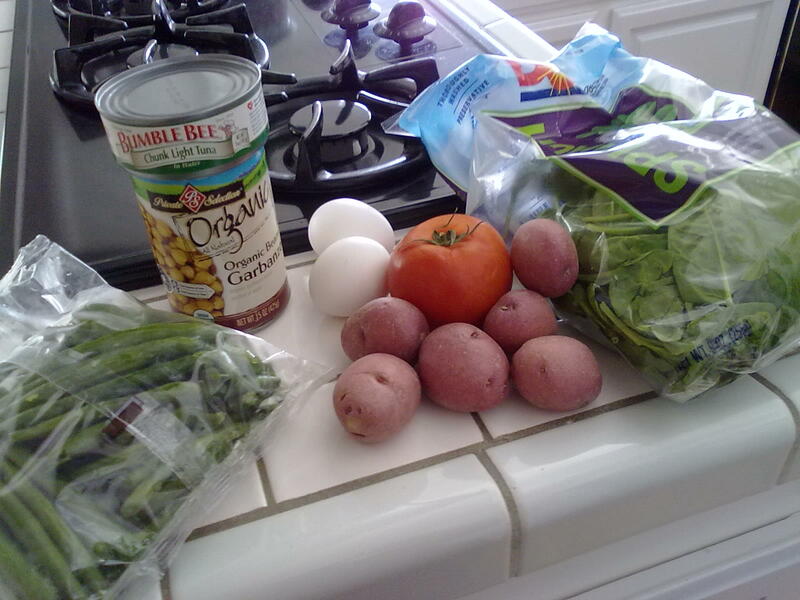 Garbanzo Beans: Organic, just like the tomato I used. Been trying to get organic stuff when I can these days, though I don't trip too much over it. Tuna/Faux Tuna: I used tuna for the man plate and chickpeas for a toned-down version of my faux tuna concoction. Nicoise salads don't call for tuna-salad type tuna, so I just used what came out of the can with some cut-up pickle and salt/pepper. Likewise, I added some nutritional yeast, a little lite mayo, mustard, pickle, and salt and pepper to the beans. Without celery, it definitely lacked the tuna-ish-ness, but that's okay. Dressing: This was the first time I made dressing, and it turned out wonderfully in spite of the substitutions I made due to not having the ingredients! Basically, I used some peach butter, red wine vinegar, dijon mustard (which I don't like but didn't bother me in this use), salt/pepper, lemon juice, and of course, olive oil. Then, I gave it the old fork-whipping. I'm definitely starting to get more creative with my cooking, given that I haven't had much opportunity to do it before. I can definitely say I'm getting a lot more nutritious meals than what I was raised on, though I'm sure I'm going to make an Asian dish at some (soon) point! Finally, the great part about making dinner is that there was plenty leftover for a hefty portion for "The Ukrainian"'s lunch the next day. Gotta praise a dude who will eat salad, right? Doesn't this look like a (sloppier version of) pre-packaged salad?